This week, guest blogger Tina Aguilar speaks with the organizers of Architecture for Humanity – Dallas/Fort Worth Chapter. Stephen Lohr and Ryan Behring co-founded the group. They and fellow design ambassadors Jared White and Ashley Brightwell talk about design philosophy, their local design efforts and how creative minds make a difference. This week we speak with the organizers of Architecture for Humanity – Dallas/Fort Worth Chapter. Stephen Lohr and Ryan Behring co-founded the group. They and fellow design ambassadors Jared White and Ashley Brightwell talk about design philosophy, their local design efforts and how creative minds make a difference. Architecture for Humanity (AFH), a humanitarian non-profit organization, was formed in 1999 after co-founders Cameron Sinclair and Kate Stohr noticed the needs of refugees in Kosovo. AFH is based in San Francisco and boasts a premiere Open Architecture Network, where thousands of design, development and construction professionals provide support with representation from 60 chapters across 25 countries. AFH’s volunteer vision and access affirms the benefits of creative collaboration, allows remote supervision of projects and magnifies design expertise for its clients. Tina Aguilar: How big is the AFH Dallas/Fort Worth chapter? Stephen Lohr: Sometimes 10 people show up, sometimes 50 people show up at our monthly meetings. We are able to use social media, and Facebook has been a really, really good thing for us. We have several hundred people following us on Facebook, so it seems to be a much more effective way to communicate than e-mails. We have a good core group of around 30-40 people, and some have really begun to take on leadership roles. Jared over here, along with Alexis Flores, is one of the people that took on the role of leading the “Hearts and Hammers Project.” He can tell you a bit more about it. Jared White: I guess I am the Director of Community Relations for our group. I’ve been with the group since they started. I had previously worked at a large firm that participated in “Hearts and Hammers” (right) before, and I had been a construction captain. We’re [AFH] new, and we’re looking for ways to get involved with the community. It’s through the Dallas Housing Department, and it’s called People Helping People. The event is held every year, two weekends in September, and essentially they take homes based on need. Homeowners have to apply, and it gives the house a facelift and doing any kind of aesthetic or things that might be code violations. It’s typically for elderly, low-income residents who can’t afford to pay for those services or who can’t do it themselves. We gave the house a fresh coat of paint, new siding; we added handrails and stairs for [the homeowner] because it was hard on her to step out of her back door. We focus on the things that the city needs from a bare minimum standpoint. We are helping these people out so that they don’t have to move out of their homes. This is our first year to take it on. As you know, the economy’s not so great right now for architects or designers, so we were able to tap into some other resources that we knew through our networking. We were able to get some laid off, unemployed architects to help out, and our homeowner was very happy. S.L. : It was great, and we had 15-20 people show up each weekend. Everybody pitched in. That was an example of how I think we’re starting to be able as a chapter to do some fun stuff, help out. I think the ideal goal for us, at least the way we see it, is to be almost like a matchmaker and be a liaison between non-profits and people who want to donate or give to those in need in the city. We see ourselves as this group that can lend design assistance. AFH nationally believes everybody deserves great design. It shouldn’t be for the privileged or few who can afford it. Everybody should have good design. We want to do it locally. 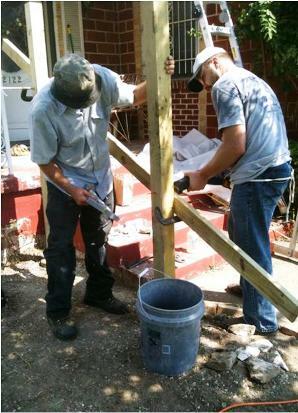 We helped out with the Haiti effort and rebuilding. We had a fundraiser here and showed the film One Peace At A Time by Turk Pipkin, who is a writer, director and actor from Austin. We really want to be able to impact our communities. As we do these different events – we’re doing “Canstruction” again this year – the goal is to experience it and see how we work as a group, and to be able to build more and more credibility with the community and have people calling us when they need to. T.A. : How did you decide to work in this industry, and what led you to AFH? Have you always been in design? S.L. : I was an art director in advertising for a long time here in Dallas at several agencies. I’ve always wanted to be an architect, as a kid I wanted to be an architect. I was really young when I started college but didn’t pursue it then. Several years ago I told my wife I want to go back to school and get my Master’s in Architecture. Thank God she let me. I just finished last December, and I have been working the entire time while I was in school at UTA. I was also working at an architecture firm, and they were fantastic about letting me work 20-hour weeks. So yes, I’ve always been a designer, but it wasn’t in building design. T.A. : The power of a creative mind. Ryan Behring: He told me the same thing. S.L. : He told Ryan the exact same thing, and we learned about each other. T.A. : AFH was able to connect you two a little over a year ago. Ryan, what about your background? R.B. : I also am an architect, and I was laid off from my first job out of school, a week before we started this chapter. I thought, wow, now is a good time to really invest time in getting this thing going. The way this organization works is they have a participatory design process; they go in and the first questions are, “What would you like out of this building, what is a comfortable place for you, what is an inspiring place to you?” Really to give the users input. The global organization was founded back in 1999, and the founder of the group was at the time out of New York and, fast forward six years, was granted a TED Prize from the technology, entertainment and design conference in California. He was one of three recipients, and that is what led to the writing of his book or the beginning of what we call the open architecture network, which is an open source model of sharing architectural design ideas. This is certainly one of the principles that we operate by: it’s not my design, it’s our design. You know, if a community wants to replicate a design – if it’s appropriate – that we’ve designed here locally, they can do it; it’s covered under creative commons license. They may have to find a local architect to put their stamp on it, but all the drawings, all the ideas that we’ve posted are theirs. So that was another thing that sold me on the group: This open model of business and the resources we have today with social networking, a free flow of ideas. T.A. : How often do you meet? R.B. : The third Wednesday of every month. It’s a bit of a challenge, because it’s such a big region with Dallas and then Fort Worth and Arlington. We try to alternate every other month to cover all our bases and try to get UTA students involved and the architecture community involved. T.A. 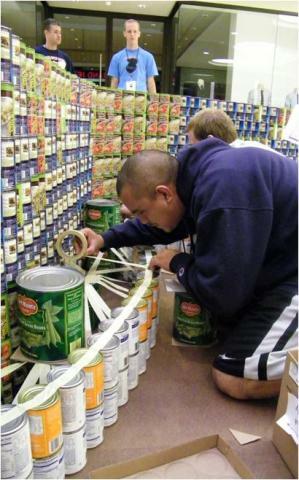 : What does it take to orchestrate the “Canstruction” event? How long have you been planning this? R.B. : The build is this Saturday, from 6 a.m. – noon, and the mall opens at 9 a.m. and you can come in and see us working. We’ve got about a 30 minute old photo here [Stephen scrolls to the image on his phone] of our team member doing a mock build right now in her garage. So the plan in process started in June, and the Canstruction committee works together and has a call for entries and typically there’s like 15-20, primarily architectural and engineering firms in the Dallas area. This is the second year where we’re the only non-profit participating, so it’s a bit unique in that way. S.L. : It’s much more challenging from a fundraising perspective. Most of the other people are big companies. R.B. : They will typically have from 5,000-8,000 cans. We have to be very creative in how we use our cans. Last year we had about 2,000, which is still a big contribution to the [North Texas Food Bank]. But you know when you’re side-by-side with someone who’s three times your size, you’ve got to be creative. You’ve got to think on the fly. Jared came up with a great innovation last year. We had some left over Folger’s singles packets, and we draped them together to use them as a bookmark. S.L. : Some of these big companies can start months out and have the finances and space and storage. So they can buy 5,000 cans and put them in storage and make sure everything is perfect. We just don’t have that option. We store all the cans in someone’s garage. R.B. : They are in Stephanie’s garage. T.A. : There’s an energy with creative thinking and being able to come up with an answer or ask questions as you are working and as you are thinking about a project. S.L. : Last year as we started stacking cans, we realized, “Oh my gosh, this isn’t going to work, they’re going to fall.” So, actually, we began figuring out ways to use tape (right). We didn’t have enough cans to do a solid wall. So we figured it out with stuff that we’ve learned over the years and it worked great. T.A. : That sounds like a lot of fun. Since you’re using social media, are you going to have somebody standing by to Tweet anything you need? S.L. : We’re not that cool. R.B. : We might – we have a Twitter account: afh_dallasftw. T.A. : You were discussing an AFH architecture tour earlier. S.L. : We had two different groups leave from Victory Station. Ashley will be able to say a little more. We traveled through Dallas on the DART Rail. Ashley Brightwell: It was called “Dallas Through the Eyes of an Architect,” and it was all on the Green Line. We stopped at the West End, and then we got back on and got off at Akard Station and went through Thanksgiving Square. It’s a fantastic example in Downtown, and then we went to the restored post office and walked down to the DMA and One Arts Plaza. We ended up at Exposition Park. The purpose was to expose people to all the different places along the rail and being aware of the architecture in our environment. It was surprising to see how many people had never been on DART or to see Thanksgiving Square. They all found what they liked about Dallas with public transportation and different nodes where you find various characteristics [in the setting]. Exposing people outside of architecture to Dallas allowed them to walk around with their eyes finally open. Architecture for Humanity DFW will also participate later this month with Art Conspiracy 2010. Interested volunteers and design queries can be made to [email protected] or [email protected]. Check back for more about the Playhouse Fun Project later this fall.